What makes it special? Beautiful scenery of river valley and private pool. Leisurely spread throughout hillside gardens, between a steep river valley and gently swaying fields of rice, Bali’s award-winning Maya Ubud Resort & Spa is a masterpiece of contemporary wonder and ethnic chic. Natural colours and local materials have been blended to harmonise with the environment; three exceptional restaurants offer specialties from around the world; and the delightful accommodation includes individual Balinese-style villas, many of which boast private pools. Favoured by honeymooners and holiday makers alike, Maya Ubud is an ideal choice for those looking for luxurious facilities in a special piece of untouched Bali; a wedding destination or a romantic hideaway, where guests can experience peace and tranquillity in beautiful surroundings with personalised service and excellent food. wow. That place looks awesome! As soon as I have $1200 just laying around I’ll make my reservation. The location is just stunning. 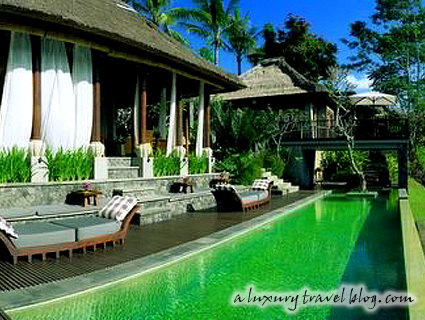 Conveniently close to the centre of Ubud. The Spa is heaven.